At the Florida State Fair, Tampa, FL. A while back, the cafeteria where I work would serve these things called "veggie sticks" - basically leftover vegetables mixed in with mashed potatoes, shaped into logs, crusted and deep fried. It was considered the "healthy" option. 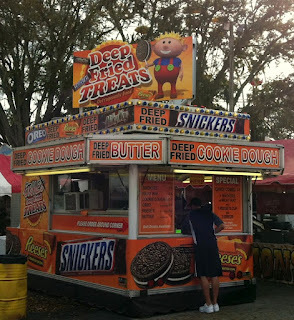 I used to think that the fascination with battering and deep frying various things was peculiar to the American South, but I see that it's become a staple of carnivals and fairs. After all, once deep fried candy bars entered the picture, well, things got out of hand. 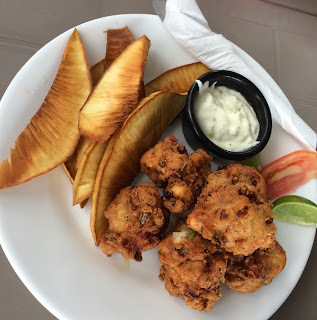 While there is nothing inherently wrong with deep frying things, some of the items chosen for battering in deep frying are more for novelty than taste. Deep fried beer? or Kool-aid? The problem with these ideas is that both items are things that don't taste good when consumed hot - and deep frying just heats things up fast. So, I propose making deep fried hot chocolate - a beverage that actually is good warm. And I'll suggest how to do it: the cocoa, sugar and milk mixture could be solidified with a low concentration of agar, before being chilled and battered and fried. What is agar and why use it? Agar is a mixture of carbohydrates from some algae that can gel liquids - this is also known as kanten jelly or gulaman. But agar has a really interesting property - it exhibits hysteresis. This means that it's gelling state at a certain temperature depends on the state where it was before it got to that temperature. Agar melts at about 90°C, but it does not gel until about 40°C. That means that between 40°C and 90°C, agar can exist as either solid or liquid depending on how it got there. While agar is being heated up, it stays solid until it hits 90°C. But cooling down from 90°C, it will stay liquid until it hits 40°C. So, an agar solidified block of chocolate will be solid until it is deep fried, where it will melt in a bag of crispy batter. But it will stay liquid as long as it stays warm, and thus, delivering the messy hot chocolatey goodness when you bite into it. Although I don't think you can serve this on a stick. All right, gastronomists? You're welcome.